Michael Jackson was the most influential pop icon in modern history. So it&apos;s no surprise that when he passed away last week, many political leaders from around the world delivered written condolences acknowledging his unparalleled impact. Some reporters even questioned President Obama&apos;s lack of a formal response, noting that MJ had a long history of using his star power to influence humanitarian efforts. • At only 25, Mike&apos;s name was ringing like his manager&apos;s phone. Here he accepts an award for basically allowing his classic hit "Beat It" to be used for a campaign against drunk driving. Also, I can only assume that Reagan must have felt that the moonwalk really complimented his Star Wars program. • With assistance from Nicole Ritchie&apos;s dad, MJ wrote one of the most well-known hooks of all time and recruited 45 musical all-stars to hop on the track. Revenues exceeded $100 million and were donated to the humanitarian organization "USA for Africa," which specifically helped to alleviate hunger in Somalia. &apos;09 remix, anyone? 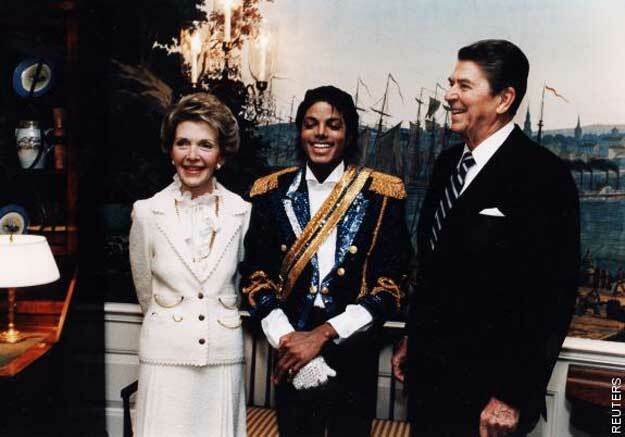 • In his second visit to the White House, MJ gets props from the former head of the CIA for being named "Artist Of The Decade". You know whose phone got tapped after this ceremony. • Jackson, a supporter of the Democratic Party, looked out for Clinton and delivered this memorable performance at Mr. 42&apos;s Inauguration. But when it came to groupies, Bill definitely gave MJ a run for his money. • In a rare show of formal recognition, members of the U.S. Congress held a moment of silence in honor of the legend&apos;s untimely death. R.I.P.